The other night, my friend Chris and I went out to dinner at Commissary in D.C.. We were both happily surprised to find a lot of vegan options—I because I’m vegan, and Chris because he’s been trying to eat more fruits and veggies with the new year. One of the dishes we decided to order was the roasted beet hummus, a dish I’d seen before on the web but had never actually made or tried. It was delicious—suspiciously similar to Sabra hummus in taste (hmmm), but delicious—and I resolved right then and there that it was time I hop aboard the beet hummus train myself. Funnily enough, one of my blog readers emailed me just a few days ago saying she’d tried the very same dish, and asking how one might replicate it at home. I said I thought one might simply roast the beets and then blend them in in the food processor, and as it turns out, that’s about right. 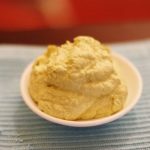 This hummus looks a little “grainier” than regular hummus in the photo, but it’s as creamy as can be. If you’re intent on an utterly smooth texture, you could try using the Vitamix, but I didn’t think it was necessary, and with a food processor, you don’t lose any of the hummus in the bottom! Preheat oven to 375 degrees. 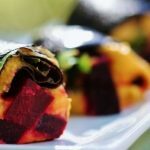 Wrap beets in foil and bake for 30-40 minutes, or until they can be easily pierced with a knife. Run beets under cold water for a few moments, and when you're sure they're cool, slip the skins off with your fingers. Quarter beets and set aside. Pulse in the rosemary (omit it if you don't care for it). Serve, with crackers or pita chips if desired. To save time, you can cook the beets a day in advance, or use store-bought, prepared beets. Hummus will keep for up to 5 days in an airtight container in the fridge. The rosemary here is optional, of course: you could use fresh dill or parsley instead, or you could omit the herb altogether and simply proceed with hummus as usual. But I did love the way the rosemary brought the sweet and tart flavors of this hummus together! 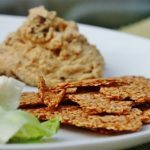 Serve this as you would any hummus: with flax crackers, with veggies, on salad, in a wrap or sandwich. Or with a spoon, of course. Enjoy! Special announcement: next Wednesday night, 1/23, I’ll be joining my friend Kris Carr and the lovely Alex Jamieson for Dinner with Kris, a new segment in which Kris invites a special guest or two to chat about health and wellness. We’ll be doing this dinner segment by phone, and readers are invited to call in (you can use either a cell or a landline) to ask questions. The goal is a totally interactive evening! How to eat for digestive health and greater energy. How to create a healthy diet & lifestyle from the ground up. How food affects motivation and mood. How to overcome food cravings (sugar, caffeine, dairy). How to embrace and love yourself today while gently working towards vibrant, long-term health. Alex and I are online buddies, but we’ve never gotten to chat in person, so I’m excited to “meet” her. And of course, it’s always a blast catching up with Kris. To join in, you do have to own Kris’s new book (which I reviewed last week). I know that many of you commented to say that you have it, so if you do, I really encourage you to call and chat with us! The transcript will also be available online for owners of CSK after the event. And I’ll be giving a quick wrap up here on the blog, too. Check out details here! Love this idea for a hummus. I’m a big fan of beets and a big fan of hummus, but I don’t think I ever would have thought of combining the two. Gena! That looks absolutely BEAUTIFUL! It sounds lovely, Lauren! Except it’s not vegan, because of the honey. I’m sure maple syrup would work nicely though. I’ve made a very similar recipe for years, but funnily enough have always gone for dill instead of rosemary, even though I had to buy dill and rosemary was overflowing in my parents’ garden. I always particularly enjoyed the split second panic of thinking I was dying in the bathroom at 3am the next night, too. It does look gorgeous. I don’t believe I’ve ever tried beet hummus myself but I loved this beet pate: http://freshyoungcoconut.blogspot.com/2011/07/rosemary-beet-pate.html It has sunflower seeds and rosemary too, which as you noted does really well with the sweet, deep beet flavor. I was wondering the same thing! I think it’s yellow bell pepper slices. Your photography is gorgeous; I love the bright fuchsia hue of the hummus. Also, rosemary is one of my favorite herbs, especially since I have a huge pot of it growing at my house. Thanks for the recipe! So much excitement! I just saw a a recipe for white bean beet hummus in Whole Living… I’d never heard of it before! Looks like the humble beet is having it’s moment and I’m definitely on board. And congratulations on dinner with Kris!! I’m a huge fan of you both… a humble beet amidst… Idk, what’s a stately vegetable? Anyway, I realize we lose the interactive part if we sadly have to miss the discussion… but are there podcasts or videos available for us to tune in after the fact? Have a happy Wednesday, Gena!! I read about it just the other day. Good timing, since I spent a great part of this semester studying the microbiome! I can imagine this initiative being either really instructive and pathbreaking, or possibly leading to a lot of at-home concern and confusion. I hope that it is ultimately the former, of course! This is the most gorgeous plate of hummus I’ve ever seen! My little girl would love its’ color. I love your little bowl! It looks gorgeous with the bright red hummus in it! YUM!! I am so excited for this recipe. Did you know beets help increase your red blood cell count allowing your body to bring in more oxygen. I am heading to Aspen in a few weeks so this will be perfect for helping me adjust to the elevation change! Thanks! I first tried beet hummus this summer and have made it many times since. I used sumac in mine, but rosemary would be equally delicious! oooh, beautiful and fun! I’ll definitely try this. I love hummus, and I love roasted beets… so I’m pretty sure I’ll love this combo. Thanks! This looks wonderful, love the idea of beets in hummus and the color is amazing! Looks great! You may be able to improve on the texture if you peel the chickpeas. 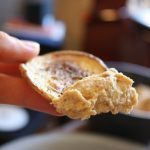 I recently tried this method for making smooth hummus, as suggested by Smitten Kitchen. It’s tedious but makes wonderfully creamy hummus. Thanks Karen love your little bowl!!!!!! oooh, beautiful and fun! I’ve been wanting to try beet hummus and yours looks gorgeousI love the color of it, so vibrant. I think the rosemary would be a lovely addition.. Thanks for the interesting and useful post.. Absolutely adore this! The color is fantastic and the taste is sublime! We added a bit of garlic, paprika and pepper instead of rosemary and will definitely be making it again in the future. my beautiful 10month old just LOVES this dip!! Thank you for your wonderful, clean recipes! just gorgeous tasting! So glad! Thanks for sharing! Love beet hummus! And what a stunner on the table. Would you mind telling me where that yellow dish towel is from? I LOVE it! Hey Coley! It’s from Anthropologie. So glad you like the recipe. 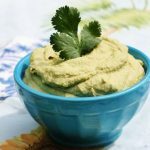 Should I modify the recipe if I were to use a Vitamix in lieu of the food processor? For the most part it should be fine, though you may need to add a little extra water to help get things going. Enjoy!